The weekend ahead is a big one for jazz guitar in the Columbus area. The annual Capital University Guitar Festival returns to Huntington Recital Hall at the Capital University – Conservatory of Music in Bexley on Friday, April 5th, starting at noon with clinics led by Capital alumni all afternoon (click here for details). Friday’s schedule culminates with “An Evening With Peter Mazza” at 6pm, as New York City-based guitarist Mazza presents “an evening of solo guitar arrangements and compositions.” Mazza continues his Columbus schedule Saturday, April 6th at 8:30pm at Filament at the Vanderelli Room for “a special evening of intimate solo and duo guitar with Peter and Filament Artist-In-Residence Zakk Jones.” Details here. To wrap up the weekend in style, Market District Kitchen and Bar in Bexley will host a Guitar Summit/Brunch Anniversary Party on Sunday, April 7th at 11:30am, celebrating one year of Doug Neel’s weekly brunch performances and featuring Mazza, Neel, Jones and Cincinnati guitarist Brandon Coleman in a variety of formations. Mazza will have select availability for lessons Thursday through Saturday, contact Mazza here to inquire. 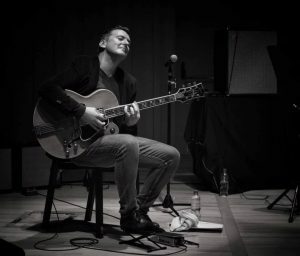 I was happy to have chance to talk to Peter Mazza recently about his first tour after the birth of his sixteen-month daughter – keep reading to learn much more about these intimate opportunities to see world-class jazz guitar in action! What can you tell us about your Capital appearance Friday? Peter Mazza (PM): It’s a little different than last time [read our 2017 coverage here]. They booked me to play in the concert hall and then do a little talk. Last time I was here I did more of a very casual clinic, where everybody was just hanging out. [This time] they wanted me to come and do something more substantial performance-wise, so that’s an interesting thing. I’ll really be playing solo, which is not something that all guitarists are comfortable with but happens to be something I’ve invested a lot of creative energy and time into, being comfortable all by myself. Tell us more about your solo style, which will also be showcased Saturday at Filament. PM: [I understand Filament is] supposed to be a cool spot, right? I hear Zakk [and Gerard Cox] are trying to cultivate more of a listening vibe, to do creative music of different types. I see myself – I kinda hate these titles – but if I had to reduce it to something, you know: “Modern straight-ahead.” I love swinging, I’m actually playing standards, and my take on standards is always trying to use the familiarity of them to connect with people. But among my colleagues and people who know me, I’m definitely also trying to put a personal stamp on them and kind of stretch the boundaries of harmony and rhythm and texture. Like I said, a lot of guitarists who are fantastic, outstanding group players – if you take away the band, they would tell you, “Wow, I feel a lot less comfortable playing in that format.” But for me, not only do I love all the great solo jazz guitar players, and piano players, but I also love choral music and arrangers for small and large ensembles, so I try to simulate some of the textures of ensemble writing squeezed into the six strings. Among guitarists, it’s certainly known as challenging stuff to play, so it’s stuff that I’ve worked really hard on, being able to expedite on my instrument, versus writing it out for a horn section or whatever it is. It’s lush stuff for sure. But it’s still cool and swinging kind of stuff. What a lineup for Sunday brunch! I assume you’re going to present a range of settings (solo, duo, trio, etc.)? PM: Yeah, last time I was in town we did something at Brothers Drake. We did that kind of impromptu, and we had so much fun that when I told Doug I was coming down, he really wanted to do another guitar thing. Here’s the thing about those guys: I’m 50 years old, I’ve played in New York for 30 years. And I kinda like this about New York too, but I feel like I can play with these guys and nobody’s trying to knock the other guy out. Brandon has a lot of chops and a lot of language, Zakk is definitely an impressive young player, and Doug is a no-nonsense, lyrical, swinging player. I think it’s a good vibe. The danger when you get four guitar players together is that it’s gonna be a duel, a “last man standing” kind of thing. But I think all of those guys, with as much as they have to say, they’re all really gracious players and people. I think it’s going to be a very good hang. Is it ever a challenge switching from solos to duos to trios and back, while keeping your head on straight? PM: That’s an interesting question. Here’s what I’ll say: I think anytime it’s more than one guitar playing at one time, it can become very challenging. Because, especially for players like myself and Brandon who have a lot of harmonic and rhythmic density to our playing, it can be hard to share that space with someone else. I think duos in particular are easier because there’s still a lot of space. Playing with three or four guitar players at once, you do really have to exercise conscious restraint. But I think that comes really easy for us, because I think we all really enjoy each others’ playing and I think we all like each other a lot personally. So I think that works out. But yeah, put it this way: If you hear me playing a solo gig, you’ll say, “Gosh, that guy’s playing a lot of guitar.” And if you hear me playing with the three of those guys at once, hopefully you’ll say, “Wow, those guys must really dig each other, because they’re smiling at each other and leaving space, not just trying to knock each other out.” [Laughs] In a strange way that can be fun too, like a little friendly competition, but it can easily go down the wrong road, so I have good aspirations for our collaboration. And things are still going well musically in New York, particularly at Bar Next Door? PM: Yeah! I’ve had a close to 20 year residency at Bar Next Door, I have had other residencies that were pretty notable before that, but that’s the one I’m still doing. I played at Birdland and Mezzrow recently, I’m someone who’s active on the New York scene. In addition to being a player and a teacher, I’m also a music director for [Bar Next Door] this small but highly-regarded venue in New York. At any rate, there’s good things going on for me here in New York. Anything else you’d like to add about your visit to Columbus? PM: What’s interesting to say is that when I was there last time, everything I did was group playing. And although I’m going to do some trio playing, and quartet playing, I’m going to notably be presenting more of my solo, unaccompanied self, which is something that people know from YouTube, but I don’t necessarily perform a lot solo. So I’ve been doing more of that in New York, and now I’m coming out there to do some of that [in Columbus] too.